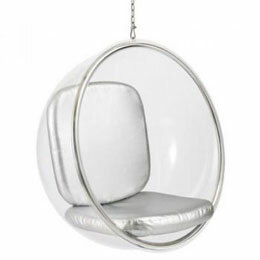 The Hanging Bubble Chair originally designed by Eerio Aarnio is made of clear acrylic and comes with white vinyl cushions. The chair is suspended from above leading to a floating or bubble-like sensation. 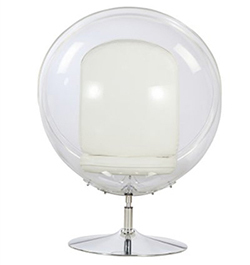 The Bubble Chair swallows the sounds and you feel isolated inside in a pleasant way, even when you are in a crowded place.